HoverCam will showcase its Pilot Series of digital teaching stations; wireless Ultra 10 document camera; and ClassFusion, a classroom presentation and learning management system in booth 1673 at TCEA 2019. At its booth, HoverCam will showcase the Pilot X a tablet-based, battery-operated wireless digital teaching station that's designed for ultramobility. The Pilot's wireless transceiver instantly beams the podium's screen and touch annotations to any interactive flat panel, projector, or TV in HD resolutions up to 4K. The tablet can be charged while docked in the station or be removed to grant teachers more flexibility around the classroom. At the end of day, users simply remove the tablet and store it in the base for security. Also at the show will be the Pilot 3, a fully integrated wireless digital podium teaching station. 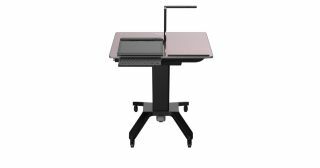 Featuring a Windows PC, 13-megapixel document camera, and 21-inch touchscreen with wireless HD mirroring functionality in a mobile podium, it combines the most important elements used in today's digital classrooms. HoverCam's Ultra 10 is a document camera that features a 7.1-inch capacitive touchscreen, true 4K HDMI output, 16-megapixel sensor, and an Android computer. The built-in, multitouch viewing monitor allows educators to see exactly what their students see without having to turn their backs. Attendees will also have the opportunity to see a demonstration of ClassFusion, HoverCam's software that integrates a classroom presentation system with a learning management system. More information on HoverCam's full line of education solutions is available at thehovercam.com.